1) Drink plenty of water. WATER helps to remove toxins from your body, hydrates, improves alertness/minimizes fatigue and helps with memory. To figure out the number of glasses of water you should drink daily, divide your body weight in half and divide by 8, which equals the number of 8 ounce glasses you should drink. You may find that you need more or less than the typical eight, 8 oz. glasses daily. 2) Treat back acne, scars and dark spots. You can visit a spa to have your back treated or (while not as aggressive) purchase a body wash that has salicylic acid in it. The trick is to ensure you wash your back first and rinse after 5 minutes. Also, be sure to keep your hair off your back and use a back brush daily. 3) Book your make-up artist early. Be sure to nail down your make-up artist. Good artists are often booked months in advanced and may not be available on your day. So act quickly! When selecting a make-up artist choose one who scrapes and does not “double dip.” Make-up is a breeding ground for bacteria and you need to ensure your make-up artist does not cause you acne. At www.ElegantFacesbyDes.com we take pride in scraping the make-up out of our palettes, cleaning our brushes thoroughly and keeping a clean and organized make-up kit. 4) Schedule facials for every 4 to 6 weeks if you have good skin and 3 to 4 weeks if you have problem skin. Facials are a good way to keep skin free from acne, hyper-pigmentation, dryness and dehydration. It’s also the best way to ensure your make-up looks natural as you’ll need less make-up to cover imperfections. 5) See a dermatologist if you need more advanced work such as chemical peels, lightening agents or wrinkle reducers. 6) Use at-home skin care products that are safe and fused with antioxidants and no toxins. 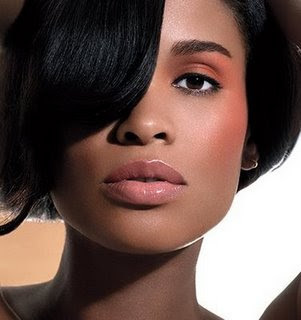 The basic system should include a creamy cleanser, toner with salicylic acid, moisturizer and SPF (broad spectrum). In addition, be sure to wear SPF so that your make-up artist doesn’t have too much variation in the colors previously selected during your make-up trial. 7) Take care of dark circles under the eye by wearing SPF around the eye and stop rubbing your eyes. Rubbing helps to cause the delicate area to become black and blue. 8) Get your brows done by a highly recommended specialist. Be sure brows are kept full and nicely arched. A beautiful face always starts with great brows. Remember: The earlier you start your skin care regime, the better your skin will look on your big day. 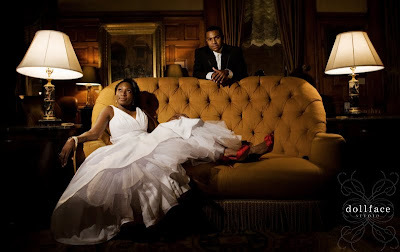 Desiree Phillips-Morisset is a member of the Ladies' Lounge on African-AmericanBrides.com, as well as a licensed skin care specialist and make-up artist based in New York. Find more of her tips at www.ElegantFacesbyDes.com. 1. Log into your google account or create one at google . 2. Click on the documents tab, it will open a new window. 3. There is a drop down tab labeled create new, click on that. 4. 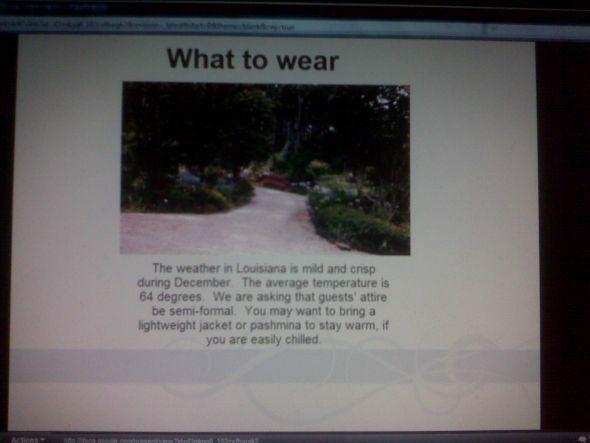 You would like to create a new presentation. 7. 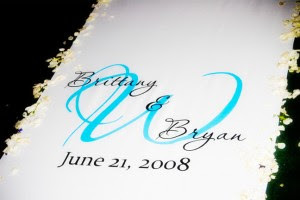 Sure enough after searching for wedding in the template section, I found Tony and Rita's wedding album and decided to use the template by clicking the button entitled use template. 8. 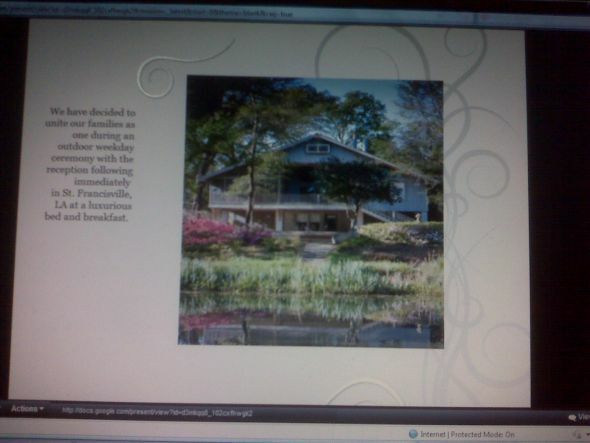 After deleting a few pictures that I didn't need and the first page, I was able to complete my email-able slideshow for my guests. Total Cost: $0.00!! Here's the completed project, so let me know what you think! For some brides-to-be, the idea of walking down a plain aisle just won't do. 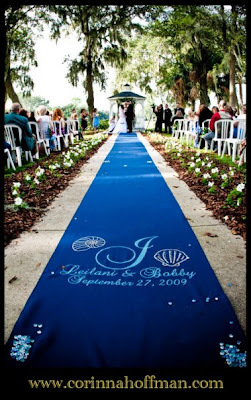 But as many of you know, it's not always easy to find a ready-made aisle runner that fits your theme, is in your style, and incorporates your specific colors. 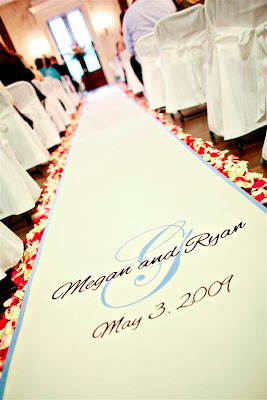 That's why custom, personalized aisle runners are becoming so popular. 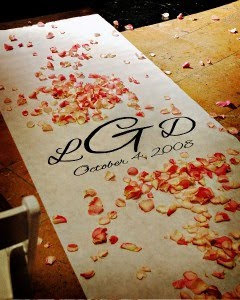 We recently spotted some lovely designs at Customized Wedding Creations, that give us a good idea of where aisle runners are headed. Take a look. 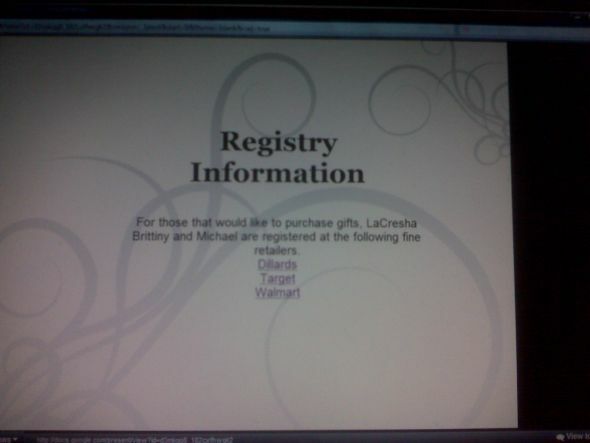 Registering was one of those tasks that I really did not enjoy when I was getting married - all those years ago. It was tedious to go out to stores, fight crowds, and use that gun - which half the time did not work. Also, you were limited as to the stuff you could register for. For instance, I registered at Macy’s and Williams Sonoma. Although there were lots of choice, you could only register for items at those two specific stores. You had to pick something that they carried (either in the store or online). In this day and age there are so many cool options. If you know what you want, you can even register without leaving the privacy of your own home. I would like to share these alternatives with you. There are two online sites in which couples’ can create universal registries - http://www.amazon.com is one of those sites. I don’t know about you, but just about everyone I know has an Amazon.com account. Amazon.com is my go to place for just about everything. If you don’t have an account, check them out. The site is really easy to navigate, and it’s even easier to set up an account. Once you have your account, you can download a widget to place on your toolbar by going to the wedding registry and downloading the universal button. From there, you can go to any site to add items to your amazon.com registry. You can still add items from Macy’s and Williams Sonoma, but you can also add items from other places - no matter how rare and obscure. It’s that easy. Another such registry is http://www.wishpot.com. Like amazon.com, the site is really easy to sign up and navigate. Like Amazon, you download a widget to the toolbar and you can add items anywhere on the web. Unlike Amazon, Wishpot is more “wedding” oriented. 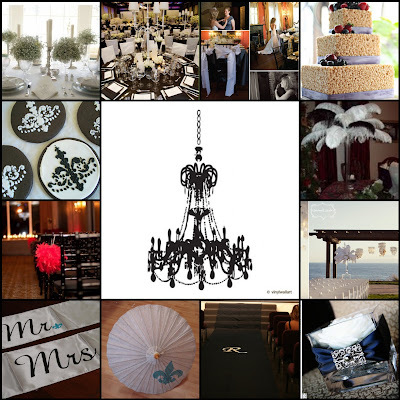 You can search for and find local wedding vendors in their resource directory. It’s also a social networking site in which you can friend people who are also signed up in the wishpot.com network. The great thing about both of these two sites, is you can also create other registries - such as birthday, holiday, and anniversary. You can have all your lists in one place - so one username and password does it all! What’s better than that? For those of you that already have an established home or are combining two homes and you do not need the “traditional” registry stuff, think about honeymoon or donation registries. 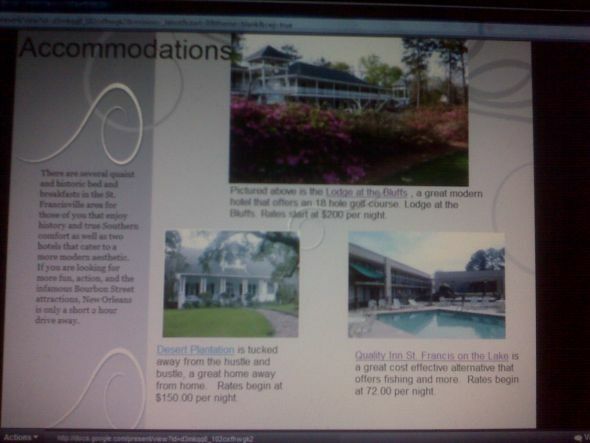 There are tons out there, but http://www.honeymoonwishes.com and www.idofoundation.org are just two such sites. 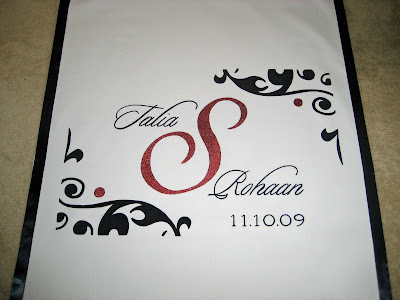 They are really easy to set up - and you just give your guests the information - like you would for any other registry. 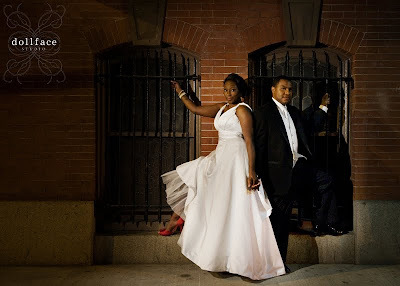 Lisa Nelson is a longtime member of African-AmericanBrides.com and the owner of Elegant Event Design. We recently got an email from a frequent reader who asked why we didn't choose more fairytale and fantasy wedding gowns for our "Wedding Dress of the Day" series. In our efforts to be practical, we do NOT want to neglect the whimsical options out there for our brides who like to think outside-of-the-box. Luckily for our fairytale brides, we were already on the case. 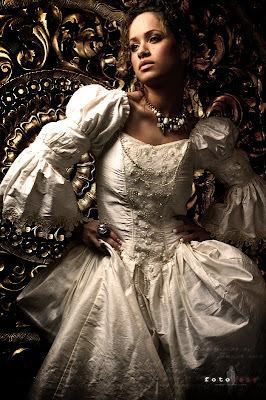 Take a look at this fairytale princess silk wedding gown from Azrael's Accomplice. 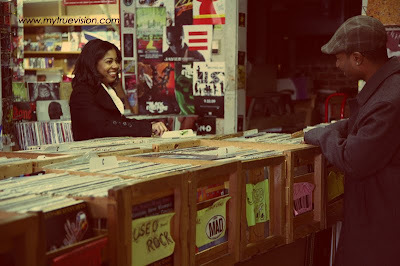 Another fantastic shoot from our good friend Carlton D. Mackey at Vision Photography in Atlanta, GA. He rocks. Want to be a bridal star? If so, you're in luck. Our friends at Get Married are looking for brides around the country to appear on their national television show. If you haven't seen their program as yet, it airs every Saturday on WE tv. Host Stacie Francombe helps brides match their personalities with their unique bridal vision through expert planners and challenges. 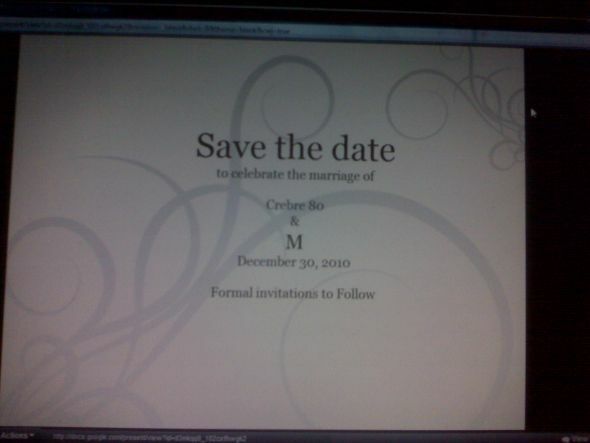 If you're interested, visit www.getmarried.com/omg for more details on signing up. These days more couples are having children before they walk down the aisle. Whether you agree with it or not, it’s still a beautiful thing when they finally take the leap. But there’s some profane feeling that after you have kids marriage is no longer relevant. Somehow the kids become the only priority. However, shouldn't the priority be the relationship? Because without a solid relationship between the couple that is legalized, sound, and court and community approved (aka marriage licensed), anything can happen. A happy mommy and daddy make a happy baby. While doing Marry Your Baby Daddy Day™, many women have told me they felt their relationships were still missing something after the children. 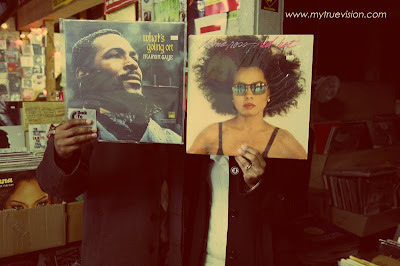 They didn’t leave the dream alone. They set their foot down and instead of hoping to get married, they expected it. They no longer settled for being strung along by their indecisive partners. 1) Discuss family planning with your partner before the baby arrives. When will you get married? Set a date. 2) Get any legal matters handled to protect you, the property and child should the father unexpectedly die or become ill. In most cases, if you are not married, his mother/family is considered next of kin and they can takeover. Check your state laws. 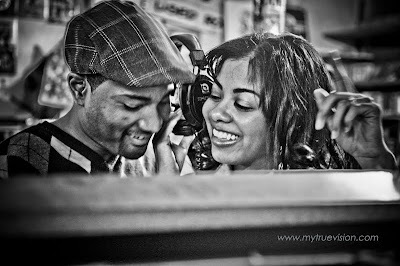 3) Communicate with your man in a nonverbal way what you expect. Come up with a plan on how to get there. Do not set ultimatums, but be creative. 4) Begin shopping for rings and wedding options together. Fake it till you make it. 5) Research all the financial and legal benefits to being married. In some instances there are tax advantages, and home financing options not as easily available to singles. If your relationship is ready for a baby, it is ready for marriage. Every home needs a good foundation. Marry Your Baby Daddy Day is an all-expense paid wedding for moms and dads who want to strengthen their 2-parent homes through marriage and build stronger communities. The 6th Marry Your Baby Daddy Day will be September 23rd. Check out my online community of moms turning into wives at www.marryyourbabydaddy.com. The opinions in this blog post are exclusively those of the author. Maryann Reid is the author of several novels, a contributor to major publications such as Glamour, Black Enterprise, etc., and a regular tv/radio social commentator. She has been on the Michael Baisden Show, Wendy Williams, 20/20, The CBS Early Show, and The New Yorker. Much more inspiration to come from this wedding planner -turned- real bride! Congratulations to all of our new readers who got engaged over the holidays! We hope you enjoy this special time in your life. Planning the kind of wedding you want can be so much FUN, but it can also be quite a challenge in today's economy. Here are some suggestions for cutting your wedding costs. 1. Trim the guest list - if possible. Sometimes it's not possible due to family situations etc. This is the number 1 way of cutting costs. 2. Consider a freelance photographer – A great “freelance” photographer might fit the bill. Often, the wedding is looked through a fresh and creative lens. Expensive back-end costs are often reduced. 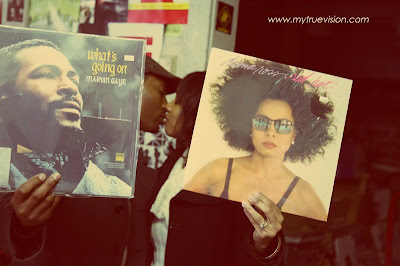 Warning – if a professional album is your goal, this might not be a viable option for you. 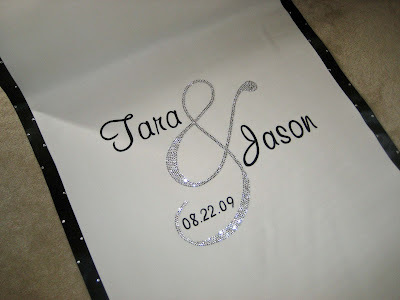 Tip - one might even reduce their cost, for a chance at getting a great wedding in their portfolio! 3. 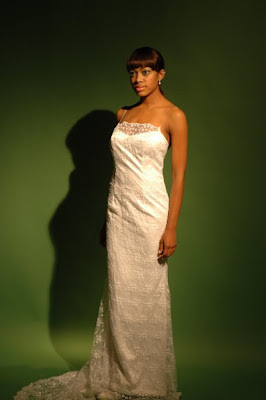 Buy a custom-made dress as opposed to a gown from a bridal salon. 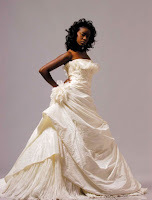 I had a bride who loved a $3,500.00 dress. We got a dress made out of "real" silk satin, a cathedral veil which was lined in the same fabric, and a bolero jacket - all for $2,000.00. If that’s not cost savings, I don't know what is. 4. Trunk shows and sample sales are great! 5. Opting for a smaller "show" cake and offering sheet cakes in the back. 6. Cutting the alcohol out of your bar (they will survive one night, I promise). Nobody is saying that you have to offer, but if you offer it - in my opinion, you should pay for it. 7. Choosing a venue that has table, chairs, glassware, silver, etc. Covering the chairs is not as expensive as renting ones (if you find an economic rental solution. Don’t rent the covers through the venue). 8. Choosing a venue you are happy with, decor wise - choosing a venue that you do not like because it’s inexpensive, and then paying twice the rental fee in decor - is not a good plan. 9. Cutting out favors, or combining favors and place cards into one offering. 10. Make every aspect of your wedding matter. Follow this rule of thumb, “don’t just do it because you think you “need’ to do it. Do it because it has a significance to you, your fiancé, your families (collectively) and your guests”. Make the significance known to everyone. 11. 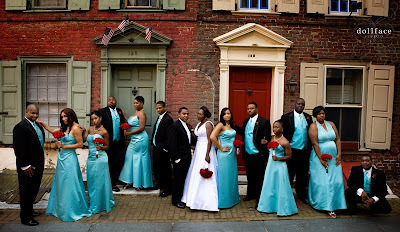 Downsize your wedding party (or have no wedding party at all). 12. Have your ceremony and reception in one place - no need to transport yourselves or your guests. 13. Rent instead of buy. Check prices. You will only use this stuff once, and renting will eliminate the need to sell afterwards. 14. Get married during the “off” season. Many vendors would love to work early December, January and February - when things are typically quiet. They might even offer you a terrific deal if you give them your wedding! 15. Create a realistic budget and prioritize. Be honest to yourself and your vendors about how much you can and/or want to spend on your big day. 16. Hire a planner who has a strong network of vendors that they always use. This will save you time and money. I hope this list will offer you realistic ideas on not only helping you cut costs, but also on maintaining the spirit of your day!